Perhaps I should be calling these Gems of the Month, since I'm posting so rarely. Thanks to anyone who's still hanging in there reading this blog. I've turned into a haphazard blogger. Recently I was involved in a discussion with other writers about world-building. As in, you're writing a science fiction or fantasy novel for kids or teens, and you need to create a world that's believable. How do you go about it? Philip Reeve is a master at world-building. Witness his Mortal Engines series. Now run to your local bookstore or library and take a look at Fever Crumb (Scholastic, $17.99, 9780545207195, for ages 12 and up, published April 1, 2010). In this stunning prequel to the Mortal Engines series, a prequel that works just fine as a stand-alone novel, we meet Fever, an orphan in London. The London she lives in is thousands of years in the future, though it feels like the Dark Ages. Vestiges of technology remain -- odd bits of circuitry and microchips. But no one knows what to do with them. The Order of Engineers, a group of eccentric men who shave their heads and refuse to show emotions, try to make sense out of the old machinery. Fever has been raised by them, and mostly by Dr. Crumb, the man who found her when she was an infant. But now everything's changing. An archeologist named Kit Solent hires Fever to be his assistant and it quickly becomes apparent that he's more interested in finding out what's going on in Fever's mind. She's beginning to have memories that are not hers. 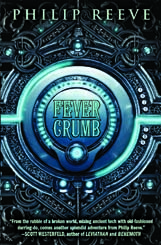 Who exactly is Fever Crumb? Who were her parents? Does she have anything to do with the Scriven, the superior humans driven out of London years ago? Written with a sure hand, and a touch of cheeky humor (in the future, there's a krishna-like group wandering around London chanting, "Hari Hari, Hari Potter"), this is a fascinating example of masterful world-building. If you're a fan of Scott Westerfeld or Philip Pullman, this is right up your alley. Top Children's Novels of all Time? Over at School Library Journal, Betsy Bird blogs about books in Fuse#8 productions. According to her profile on SLJ, "Elizabeth Bird is currently a children's librarian at the Children's Center at 42nd Street of the New York Public Library system. She has served on Newbery, written for Horn Book, and has done other lovely little things that she'd love to tell you about but that she's sure you'd find more interesting to hear of in person. Her opinions are her own and do not reflect those of NYPL, SLJ, or any of the other acronyms you might be able to name." Her blog is one of my favorites. Since February, she's been gradually revealing the results of a poll in which I happily participated, along with many other booksellers and librarians. That was a tremendous amount of work, and I want to thank her for her amazing efforts. Counting down from 100, she's just finished announcing #1 which was my pick for #1. Yay!). If you want to see a straightforward list of all 100 titles, click on over to Six Boxes of Books, where Wendy, Laurie and Kathleen have diligently added them as they've been announced (extremely helpful; thanks, Laurie). If you want to read longer, more detailed descriptions of each book and why it was chosen, and see all of the various covers for each title over the years, go to Fuse #8. Her April 1st post almost gave us all heart attacks. Before she changed it to Secret Garden, she had listed... The Boy In The Striped Pajamas. AAGGHH! I'd love to hear from readers. What would YOUR top ten kids' books be?